Destination dining. Will travel for food. Just give me a reason and I’m in the car, on my way. When the cold is over and ice is gone, I’m often aiming my car toward the “West Coast” of Wisconsin along the Great River Road that hugs the Mississippi. If I go down to Winona on the Minnesota side and cross over to Wisconsin to make a large loop back up to the Twin Cities, I’ll stop to enjoy a burger at The Monarch in Fountain City, a coffee and ice cream at Hotel DeVille in Alma (soon to have a new restaurant, The Empire Room! ), a blueberry ice cream cone and some take-home cheese at the Nelson Creamery in Nelson, and a meal at the Harbor View Cafe in Pepin. OK, maybe not all in one day…but, OK, maybe. Or, if I start from the north and go south, there’s always brunch at Chef Shack in Bay City (opening for the season the weekend after this issue comes out), baked goods from the Smiling Pelican Bakeshop in Maiden Rock, all sorts of delicious options at The Stockholm Pie Company in Stockholm, followed by a meal at Harbor View Cafe in Pepin. The Great River Road: destination dining at its finest. You may have noticed that I mentioned Harbor View Cafe in Pepin twice. Because it’s always on the list. I’ve been there for both lunch and dinner and heartily recommend both. It’s a tremendously popular dining spot for people from the Twin Cities, so much so, that we’re always looking around for people we know there. A path has been worn between here and there, and here are some tips for the trip. A place to slow down and take your time. Enjoy the ride and see the sights. 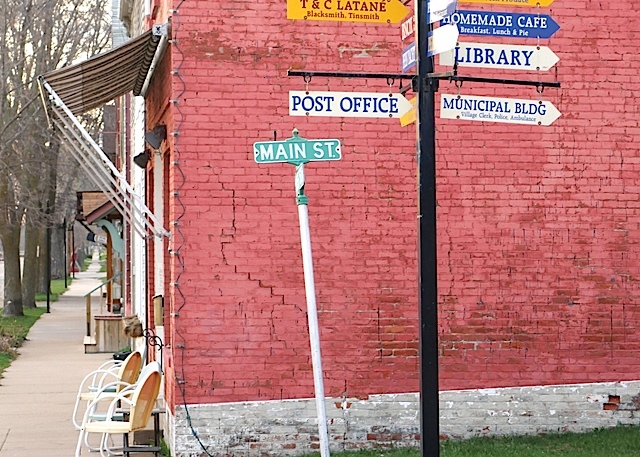 One of the best parts about dining in Pepin, Wisconsin, is getting there. I’ve already talked about how I tend to make plenty of stops on my pilgrimage to Harbor View Cafe, but there’s also plenty to be enjoyed if you’re driving straight there and back. The views, the curves, the topography. Gosh, I love the sensual and subtle differences of traveling along the river, with bluffs and drops and diversity. One of the questions you have to consider is how you want to get there and back and much of the answer might have to do with what else is going on that weekend. This particular mid-April trip coincided with a Flood River Run that went from Prescott to Winona and involved countless motorcyclists who formed what was a parade at parts and a parking lot at others. 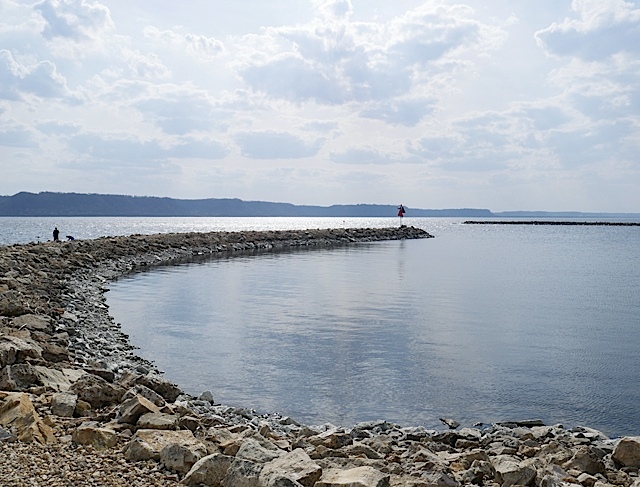 Other trips have coincided with the weekend of 100 Miles of Garage Sales with some slow-moving traffic that stops frequently or the Fresh Art Tour that invites us to tour open art galleries along Lake Pepin. Stop and smell the flowers (or art or garage sales or motorcyclists) or feel free to take a faster, two-lane highway route via the Minnesota side, crossing over at Wabasha to Nelson and looping North to avoid the slower traffic. However you do it, skip the stress and get there with plenty of ease. Your stomach and taste buds will thank you. The Hereford beef tenderloin served “Oliver Hardy” style. Get your name on the list and relish the wait. Harbor View Cafe doesn’t take reservations, but don’t you fret. You can get your name on the list and enjoy your wait if you get there early enough in the day. No, seatings don’t go on all day (if you’re there as part of the lunch crowd) or night (with the supper rush) as the hours only go so late, so checking the hours for that particular day and meal as well as getting there on the early side are important. But, take it from me and my experience this past Saturday, you can get there at 4:00, put your name on the list for the 4:45 opening, and get in on the first seating. They’re such pros with their process that the seating was handled like a roll call and smiles were abundant. It’s not even disappointing to get there after they open and learn of a long wait. Last August, when told that there was an hour and a half wait, the answer was to happily add my name to the list, go wander down by the harbor at the river, come back to the Cafe, get some wine (and coffee for me), and sit in the adirondack chairs to listen to some live music as we sipped our libations and waited for our table. The town and view make for a lovely setting to be mindful of our surroundings and slow down a bit. 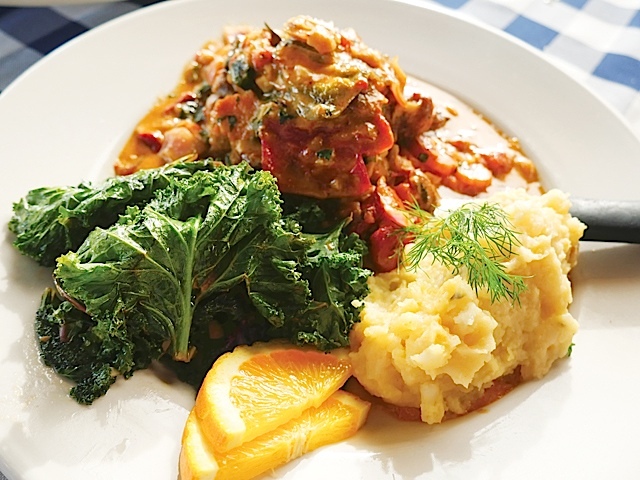 The Berkshire braised pork shank with mashed root vegetables and kale. Check the menu on Facebook. The menu changes every day for each meal. Perhaps they were pioneers of the chalkboard menu movement, as that’s the only way you can learn of what’s coming out of the kitchen, with one chalkboard in each of the two dining areas. There are sample menus on the website, but refer to the photo posts on their Facebook page for each day’s specific offerings. I’ve enjoyed the coq au vin and Swedish meatballs at various times over the years, but actually look forward to visiting the Berkshire pork shank as if it were an old friend. That each entrée comes with a side of soup or salad is only a bonus and a delicious throwback to the less à la carte days of small plates and shareables. That doesn’t mean I don’t share. I do. Especially if you order something I want to taste. It’s just that these are full-on entrées that pack a punch as far as servings are concerned. If you order more than an entrée per person, be prepared to take some home, something which only allows the delight to linger longer. Actually, because I save room for dessert, I end up taking home some shank-to-go anyhow. It’s all about strategy. This time, our dinner dabbling included the aforementioned shank that comes with golden and creamy mashed root vegetables as well as zingy kale, the Hereford beef tenderloin grilled “Oliver Hardy” style and smothered in mushrooms with accompanying asparagus and mashed potatoes, and the stuffed mushrooms that had cheese for days and came with a garlicky linguine. Each entrée came with a side salad or soup, so we made our way through a caesar salad, a garden salad with peppercorn dressing, and a curried cauliflower soup, all of which were pleasing…and filling. The coveted almond cake covered with whipped cream and lingonberries. Save room for dessert. Or, just save a dessert. I learned something long ago at Harbor View, and that’s if you ask really nicely, they’ll set aside a dessert for you. I didn’t come upon this information organically, it didn’t pop into my head one day, but I was talking over dessert options with my companion when the server said, “You know, if you’re thinking about the almond cake, you might want me to set one aside for you. Those go fast.” And we did. And the almond cake and I have been in love ever since. So, this time, like a pro, maybe even before I sat down, I asked for a piece of almond cake to be set aside for dessert. And I don’t regret it one bit. And, hours later, I might have had a self-righteous grin on my face when I was informed that the groans of disappointment from the nearby table were in response to being told that the last piece of almond cake had just been sold and they had to order something else. It’s that good. As are the rest of the desserts. 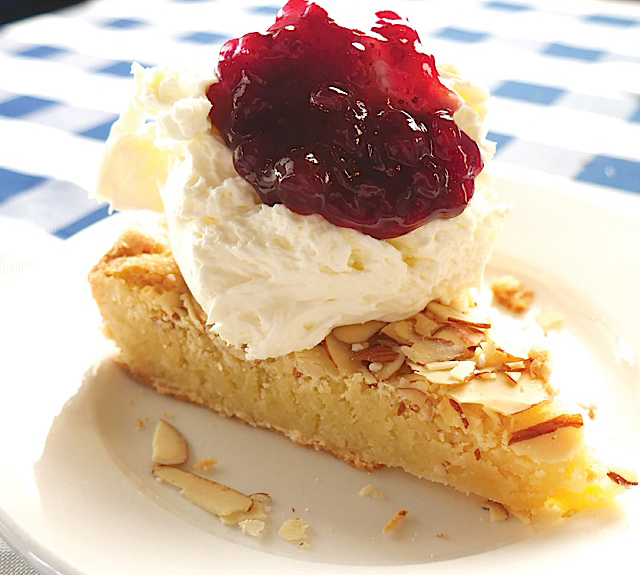 But, because my heritage is Nordic and we tend to daub almond extract behind our ears instead of perfume, the almond cake sings a siren song to me, with its chewy texture, whipped cream relief, and lingonberry accent. The sticky toffee cake is my second favorite dessert from the menu, followed by the caramel custard and the bittersweet chocolate torte. Really, there’s no loser, even if you miss out on the almond cake. In this case, a miss doesn’t necessarily mean a loss. The season is new, the months ahead of us are many. 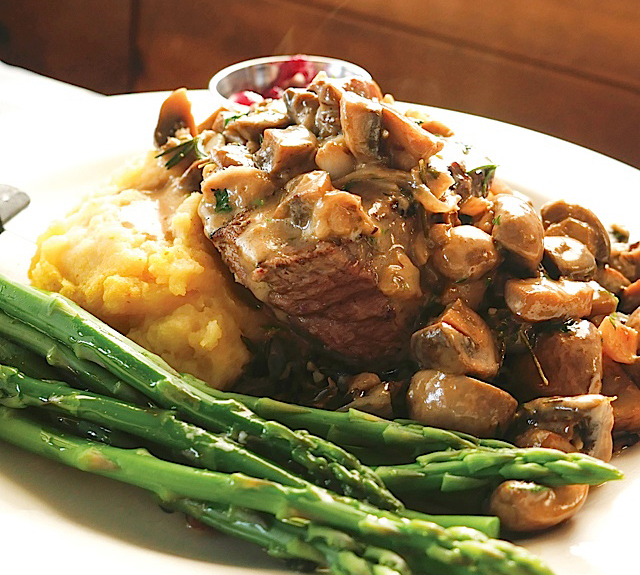 Make your plans and take your trip to Harbor View Cafe in Pepin, Wisconsin. Take it easy, get dessert, bring home leftovers, and don’t forget to take in the view.